Catching the Rare Black Snakehead. Labour Day Fishing at a Snakehead-Infested Pond. 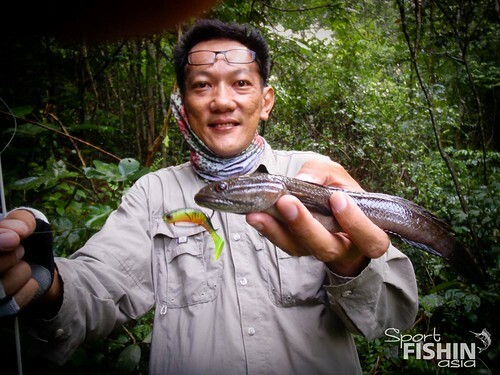 What better way to celebrate the labour day holiday weekend than doing some hard labour for wild snakeheads? Good ‘ol buddy Poh recently discovered a hidden wild pond. His text message goes like this “…pond infested with haruan… want to try?”. Haruan INFESTED! OMG. That is like the ultimate way you can ever describe a fishing hole. Resistance is futile. In my case anyway! So here I am all pumped-up to get into the thick of the infestation. But knowing Poh and his discoveries, we will first have to endure an infestation of a different kind. The dengue causing, death threatening, master of itchiness the swarm of mosquitoes (do I sound like extreme angler Jeremy Wade yet?). After a little huff and puff and passing by some rather big termite mounts we reached the summit where the next part of the journey was down some rather steep slopes. So it was slip and slides from there on. I took a short video of the terrain so that you can sort of experience it with me. It was a good thing Poh had cleared a path to the pond or it will be quite inaccessible. There was the distinctive “plop” sounds made by snakeheads coming from the pond immediately as we set upon the edge of the pond. The bites came fast and furious but before that we first have to endure a feeding frenzy of a different kind, the early morning feeding frenzy of mosquitoes. Note to self: Why do you keep forgetting bug repellents when fishing at these places? Mosquitoes are part and parcel of fishing in wild tropical jungles. Especially ones like these that are surrounded by rubber trees. The mozzies treated us as their morning buffet. I think they even bit through my pants! Though little sun could penetrate through the thick foliage I had to put on my Angler Buff as a facemask and fishing gloves to minimize the bites. Pretty handy to have these things but I only had one glove, which is meant for fly-fishing. There’s a tip for you guys when buying fishing gloves, buy a pair! I caught the first haruan on just my third cast. It was no monster but put up a decent struggle. Subsequently, I saw a rise towards the right of where I was facing and in my hastily executed side cast the lure flew upwards and hit a big tree leaf and fell straight down to the edge of the pond. I retrieved the excess line that has come off the spool as quickly as I wanted to try to make another cast to the same spot but notice my lure was snagged. I made a few jerks to the rod and suddenly realized a fish had actually grabbed hold of the lure after it landed in the water! I lifted the rod, there were some splashes and the lure came flying back. Poh was not kidding when he said this place is infested with haruan! Less than 5 casts after that I got another strike from the opposite bank. This time the fish managed to throw the hook halfway coming in. The strikes came quickly but also quickly quietened down. The pond is not big and all the commotions could have spooked the fishes. I could see tell tale signs the fishes was around the edges and some deep within the snags. I missed a bigger fish flipping my lure in-between some tree branches and bushes in shallow water and thought it would not bite again but tried anyway just for the heck of it. I was pleasantly surprised after only a few more jiggles as I actually saw a haruan shooting out from the shadows and strike at my lure resulting in a big splash. This time it stayed on the hook and I was able to land it. Heart stopping moment indeed. I also spotted periodic rises at the far end of the pond under very thick cover which I was sure was made by one fish. I told Poh I would get that fish on our way out. So I did but alas it was just a little one. In just about 3 hours of fishing I think 5 fish managed to shake my lures off and mostly in the first hour alone. We will need to be stealthier in subsequent visit to this pond and ensure better hook setting, which I am now more familiar with, after the initial experience with their characteristics. Oh ya, bring mosquito repellents. Lots of them! What tackle and lures was used? I packed soft the night before due to the snaggy nature of the spot. Taking only one shallow hard-bodies minnow profile lure with me, which was not even used. The lures that got bit were all soft plastic like the Berkley Powerbait, Hollow Belly or Grubs. And they were either lobbed right into or very close to snags. Some were flipped into and jigged in between heavy vegetation. I have to say the soft plastics are looking very impressive in quality these days. But getting quite costly too. The reel was spooled with 8 pound 100% fluorocarbon lines and no leaders were used. I like this lines, they are nearly invisible underwater, thin in diameter and yet highly abrasive resistant. A 5 foot 6 inches medium action, 5-12 pounds class rod was used, as I wanted to cast light lures and still have some power in the rod. The short length made it easier to cast and flip in the thick stuff. You should come! The journey is part of the adventure and the rewards are worth it as well. Next time, I’ll bring my hiking shoes! Great post! Go back there again when your Slider worms arrive!! Thanks! Slider worms… sounds good, really looking forward to ’em. Hope they didn’t get quarantined at the customs! Nice.. haruan looks odd though. ANYWAY… support catch & release. Did some CSI sort of work and managed to ID that haruan as Channa Melasoma (Black Snakehead) or commonly known as Haruan Palas. Interesting stuff! so POH manage to locate another gem ……Well done! Yup, let’s hope it stays a gem.